OKLAHOMA CITY, Ok — The wide receiver class of 2019 is coming together. 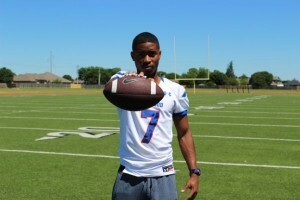 Texas head coach Tom Herman, OC Tim Beck, and outside WRs coach Drew Mehringer went north of the Red River for the latest commit of the 2019 cycle when Oklahoma City Millwood’s Demariyon Houston verbally pledged to the Longhorns. Listed at 6-foot-0, 165 pounds, Houston fits the mold of an outside Z-WR in Herman’s offense. And has the speed to back it up. Houston had a final seven of Alabama, Auburn, Minnesota, Ole Miss, Oklahoma State, Oregon, and Texas. How he fits at Texas: Houston probably projects best to the Z receiver with his speed and obvious ease at adjusting to the ball in the air. The ball tends to hang longer when thrown to the Z to the far side of the field and Houston has a real knack for changing speeds and finding the ball. He might also fit in the slot or even the X with his jump ball abilities but the cleanest fit would be the Z running posts and curls off a good slot. Coach says: Strengths – A fluid pass catcher with great adjustment to the thrown ball. Catches with soft hands away from his body. Tremendous balance at all times including during change of direction. He is a long-strider who destroys the cushion with quick acceleration off the line. Glides through his routes and doesn’t look like he’s going that fast until you realize he’s run past everyone showing elite deep speed. Lined up in slot and outside (but projects to slot). Runs a variety of routes to the deep parts of the field and coaches seem to call his routes to his strengths. Works during QB scramble to try and get open. Sells his part of fakes and misdirections well. Excels at finding soft spots in zone. Shows a willingness to play in traffic and fight for the ball. Reasonably good lower body explosiveness on jump balls. Very good vision and instinct after the catch. Showed a very nice jump cut in the open field. Can see him looking for daylight. Sets up his blockers well. A willing run blocker. Special teams contributor. Comes from a winning program having won two state titles. Well-spoken in an interview and says many of the things you like to hear from a young man. School appears important to him and he wants to be more than a football player. Areas for Improvement/Concern – As with many slot receivers, will benefit from some bulk as he is thinly built. Would like to see more upper body strength development and incorporation of a stiff arm. Hudl does not show a lot of short passing routes. Film is deficient in showing him beat press man coverage at the line. Limited blocking on film. Blocking technique starts off fairly good but breaks down quickly as he tends to play upright. Seems a bit tight-hipped which may account for route selection by his coaches (i.e., more fades, seams and posts as opposed to sharp cutting routes such as hooks, curls, whip routes). More than a couple of highlights show him give up ground trying to make a play which won’t be as effective at the next level. Ball security may be an issue as he will often fail to maintain points of contact. Team hasn’t played a close game in his two years on varsity. Missed half of junior year due to injury. Check out Houston’s highlight tape. Houston is the 13th member of Texas’ 2019 class joining Marques Caldwell (Alvin) Chris Adimora (Lakewood – CA), Peter Mpagi (George Ranch), Jake Smith (Notre Dame Prep – AZ), Jared Wiley (Temple), Tyler Johnson (Conroe Oak Ridge), Brayden Liebrock (Chandler – AZ), Kenyatta Watson II (Grayson – GA), De’Gabriel Floyd (Westlake – CA), Jordan Whittington (Cuero), T’Vondre Sweat (Huntsville), and Roschon Johnson (Port Neches-Groves).